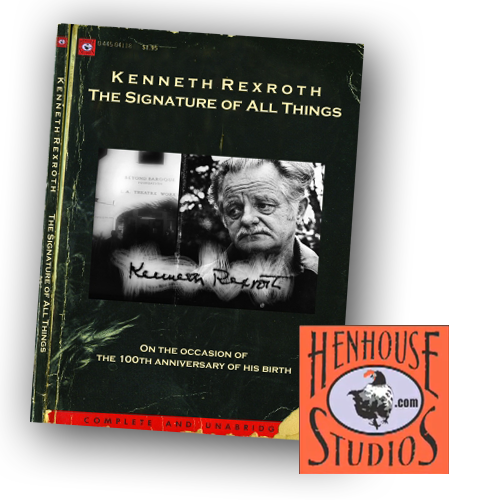 This film memorializes an evening of poetry reading celebrating the 100th anniversary of the birth of poet Kenneth Rexroth. Hosted by Michael C. Ford, this film features a broad range of poets and artists including Aram Saroyan, Philomene Long, Carol Tinker, Bob Brandt, and many more. This film was directed, produced and edited by Lindsay Mofford and Tucker was the sound guy. Other notable AHOB members: Harlan Steinberger (Executive Producer), May Rigler (Cinematographer), and Stefan Rhys (Associate Producer). 100% of the proceeds go to help defray medical expenses and help fund Tucker's artwork. This item was donated by Hen House Studios. Please inquire if shipping outside the United States.